First generation Campagnolo Record group's bottom bracket. 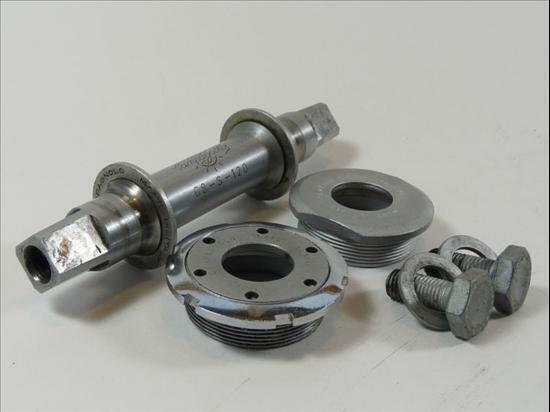 Also used with the Gran Sport's crank (non cottered versions). Uses 1/4" bearings. Count unknown. Details: First generation Campagnolo Record group. This group is later called the Nuovo Record group when the Nuovo Record rear derailleur is introduced. Some people however call Nuovo Record group simply 'Record' throughout the time frame of the introduction of the Record derailleur all the way through the mid 1980's when the Nuovo Record group production is ended.